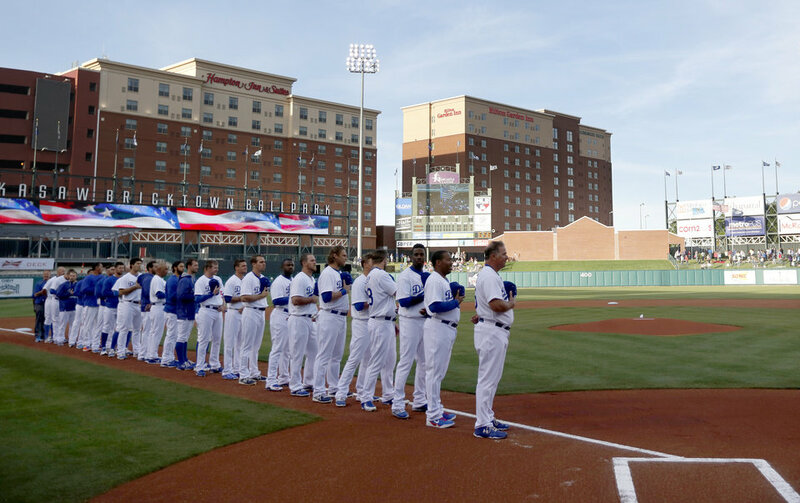 The Oklahoma City Dodgers beat Round Rock Express by the score of 12-6. The bats got hot for the Dodgers collecting 15 hits and were led by Drew Maggi, who went 4-4 with 2 singles and 2 doubles. Mike Freeman went 3-4 with 2 singles and a double. Alex Verdugo went 1-3 with a single. Joc Pederson went 1-3 with a solo home run. Trayce Thompson went 1-1 with a single. Scott Van Slyke went 1-4 with a solo home run. Wille Calhoun went 1-4 with a home run which was his 12th of the season. O’Koyea Dickson went 1-5 with a single. Max Muncy went 1-5 with a single and Kyle Farmer went 1-5 with a single. As a team the Dodgers hit 4-11 with runners in scoring position and left 8 men on base. The starting pitcher for Oklahoma City was Justin Masterson who went 5 innings, giving up 6 runs on 8 hits. Masterson improves to a 5-3 record on the season. Relief pitcher Layne Somsen went 1 1/3, giving up 0 runs on 0 hits. Somsen also earned his 2nd hold of the season. Relief pitcher Jacob Rhame went 1 2/3 giving up 0 runs on just 1 hit. Reliever Joe Broussard went 1 inning, giving up 0 runs on just 1 hit. Round Rock’s pitcher Tyson Ross went 5 innings, giving up 8 runs on 10 hits. His record is now 2-1 on the season. Relief pitcher Adam Loewen went 2/3 of an inning, giving up 2 runs on 0 hits, but suffered 3 walks. Reliever Jaye Chapmen went 1 1/3 giving up 2 runs on 4 hits. Relief pitcher Wesley Wright went 1 inning, giving up 0 runs on 1 hit. The bats for Round Rock gathered 10 hits and were led by Travis Snider, who went 3-5 with 3 singles. Jason Martinson went 1-4 with a double. Brett Nicholas went 2-5 with a single and a double. Peter O’Brien went 2-3 with a single and a home run and Ronald Guzman went 2-4 with a single and a double. The Dodgers improve to 32-27 following the win over Round Rock. Round Rock fell to a 30-32 record after the loss to the Dodgers. Drew Maggi- He went 4-4 with 2 singles and 2 doubles. Maggi finished with a game high of 4 RBI’s. Thanks to NewsOk for this photo.